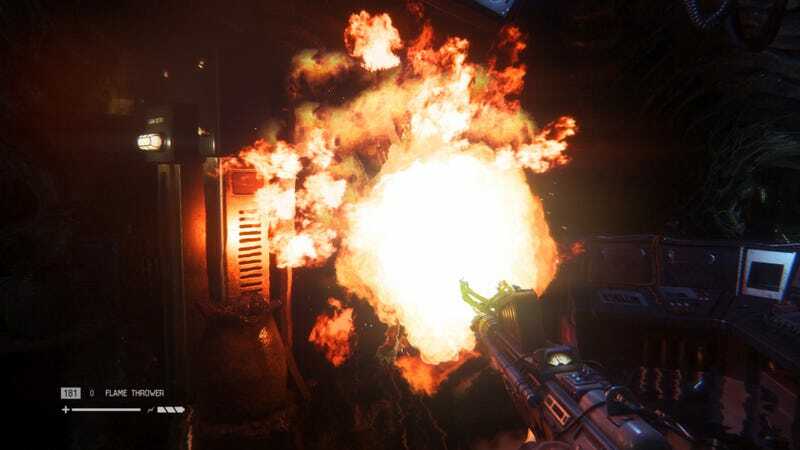 Is there any video game gun more awe-inspiring than a flamethrower? Most shoot bullets, but the flamethrower? It blasts enemies with giant gouts of flame, searing them like a juicy steak. A good flamethrower will give you some of the best moments in video games, whether it’s a close save from an otherwise unassailable foe or the amusing side effects of burning a pot farm. This piece originally appeared 1/30/16. A flamethrower consists of three basic components: the fuel, the propellant, and the ignition. When the operator pulls the trigger, the propellant sends the fuel through the ignition, where the fuel ignites, turning into a long stream of flame. There are two kinds of flamethrowers: napalm and gas. Military applications tend to use an ignitable jelly, such as napalm, which shoots further and lasts longer. Napalm is effective for clearing out structures like concrete bunkers, because it can bounce off walls and burns longer. Civilian flamethrowers, such as the ones used by moviemakers and farmers, tend to ignite a gas instead, which creates a more familiar flame effect like the one you see in movies. It may look more impressive, but it shoots at shorter range and is therefore be less potent. The best video games rely heavily on feedback, the response players feel when they perform an action. When you shoot a monster with a shotgun, for instance, it explodes into little bits and pieces, confirming that you have, in fact, killed the monster. With flamethrowers, it’s easy for that to go wrong. A lot of video game flamethrowers are intended for combat, but they’re based on movie flamethrowers, which are intended to be spectacular but don’t seem dangerous. What you get, as a result, is a jet of flame that looks amazing but hits like a feather. Real flamethrowers have ranges that can last over hundreds of feet and can destroy anything; the average video game flamethrower has almost no range and is best against small enemies. This is why so many video game flamethrowers are bad—they’re so busy emulating movies that they don’t seem very effective. As a result, players move on to other guns. The best video game flamethrowers have an effect that is immediate. When a monster gets hit, it howls in agony. Enemy soldiers come running out of cover. The range is phenomenal. Structures catch on fire, plants start burning, and before you know it, the entire world is ablaze. Here are a few gaming flamethrowers that do it right. In Alien: Isolation, the flamethrower is simultaneously a liability and a comfort while you’re hiding from the game’s lethal alien enemy. The weapon’s raw power makes the gameplay more dynamic by allowing the player to do more than simply hide until the alien leaves. It lets the player be a little more aggressive and experimental, which opens up a lot of interesting opportunities. This is great, but having the flamethrower also makes the game scarier. At one point, the game actually takes the flamethrower from you. Most players have grown dependent on it by that point, and losing the flamethrower creates some wonderful tension. Second, the scarcity of fuel throughout the game adds a new dimension of terror, because the player must constantly seek out more. 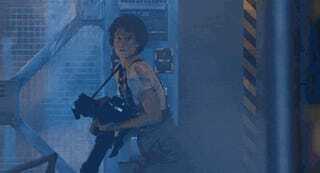 Alien: Isolation wouldn’t be scary without the flamethrower: the game would simply involve sitting still whenever the alien’s around. The flamethrower puts you in more risky situations and adds new sources of anxiety. It’s the perfect weapon for the perfect horror game. Syndicate was one of those games that deserved way more love than it got. Most of the hate came from people who had never played it and objected to the reinterpretation of a game in a different genre. As a result, they missed out on one of the most interesting shooters of the past few years. A big part of that was the flamethrower level, where you, playing the bad guy, charged through hordes of anti-corporate resistance fighters, torching them to death. This is one of those flamethrowers that makes you realize why they’ve been banned by so many world governments. The LTB-P is a cruel weapon built by an evil corporation for use by a monstrous agent. It’s a gun that works great not just because it’s effective, but because it’s the perfect weapon for the kind of person you’re supposed to be as an employee of the Eurocorp Syndicate. One of my favorite moments in the Far Cry series is from the third game, when the player, as Jason Brody, is tasked with burning a field of marijuana while Skrillex’s ‘Make It Bun Dem’ plays in the background. It’s a great single mission, but beyond that, there’s little reason to use Far Cry 3’s flamethrower. Far Cry 2, on the other hand, was all about the fire propagation, which constantly managed to surprise and excite me. The game is set in Africa, much of it in dry areas. Anything and everything will catch fire, which means that massive fires are common. Far Cry 2’s marketing was all about the fire propagation, and with good reason. I’ve stopped tons of mercs with my strategic fire placement. I’ve been killed by my own fire. I’ve seen fires that torched cars and set off ammo crates I didn’t even know were present. The LPO-50 is a wonderful gun because of the surprises it has in store for the player. What happens when it’s used is only partially under the player’s control; the rest is up to nature. If you want a flamethrower that just feels like a rock-solid flamethrower, there’s always the M2 from World at War. Based on a real-life flamethrower that was in use by the US Military from 1943 to 1978, the M2 is one of those few guns that just feels right to use. I was given plenty of opportunities to use other guns in World at War, but I never wanted to let go of the M2 when I had it. It’s effective, the range is nice, and it regenerates fuel, so you can just walk around, shooting things, and feeling great about using it. That’s the way a flamethrower should be, at the absolute, fundamental level. Out of all the flamethrowers on this list, Return to Castle Wolfenstein’s is the most like a napalm-based military flamethrower. Its range is massive compared to most video game flamethrowers, and the damage is high and fast. The cone of fire is much narrower than a traditional video game as well. If that weren’t enough, you’re often asked to use them against zombies, which just feel like a natural fit to use. The gun has its downsides, but those downsides are part of what makes it so awesome. If you’re too close to an enemy, the backdraft can actually hurt you. Enemies have their own flamethrowers, which means that they’re just as likely to use its awesome power against you. Still, it’s a blast to use because it feels so lethal against any foe, no matter how tough. The flamethrower is the gun that few developers seem to know what to do with. The weapon is often pigeonholed into a role as “tiny little monster killer,” used for killing swarms of things and looking amazing doing it. Games from Dead Space to Halo are all about this sort of thing. That’s not a bad role to occupy, but real flamethrowers are much more powerful and impressive. They’re downright terrifying to their enemies, and hazardous as much to their operators as their targets. A great video game flamethrower is one that makes you feel incredible using it, instead of an impressive-looking hairdryer. It’s a versatile, capable weapon with great range, with sound and fury that signifies something.